Thanks for this award. I will put it in my house next to my many volumes of instructional poetry textbooks. Thank you. 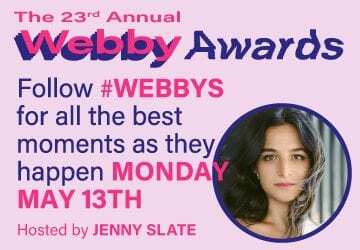 The Webby Awards is pleased to honor Funny or Die as Film and Video Artist of the Year in recognition of its full embrace of Internet culture as a vehicle for comedy and original video. Undeniable leaders in online film and video and humor, Funny or Die swept the competition this year and claimed 9 Webby Awards in multiple categories. Lauded for its original content from comedy giants Will Ferrell, Adam McKay and more, Funny or Die facilitates user participation unlike any other site by strongly encouraging fans to vote on which videos meet their landmark standard of “Funny” or “Die.” The organization’s willingness to push the envelope as video artists and comedians has elevated them to the top of their genre online and off, spawning such spin-offs as a UK sister site and a television show on HBO. It is undeniable that Funny or Die have and will continue to impact the comedy world with its incessant risk-taking and simultaneous irreverence.